Barry M are always my favourites when it comes to nails, and their latest summer collection is definitely my favourite range that they have launched! These are the nail polishes that I have been wearing all summer, we are both obsessed with how amazing they make our nails look! Their latest 'Sunset' nail launch delivers a gel-like finish to the nails, without having to go to a nail salon and without the need of a UV lamp! The range has 8 summery polishes which includes the special gel top coat, making them the perfect nails! Once again, the nail polishes have a flat top applicator brush, which applies exactly the right amount of polish and also makes painting short nails so much easier to paint! The formula of the polishes are also really quick drying, perfect for if you are painting your nails on holiday! With two coats, these sunset nail polishes look really opaque and give a really professional finish. Finishing them off with the top coat makes them look salon professional! I found that the polish lasted such a long time on my nails, especially finishing them off with the 'Daylight Curling' top coat. My two favourites from the range have to be the turquoise blue 'Way You Make Me Teal' (which I actually have on my toes right now) which is the perfect sea blue colour! I also am obsessed with the bright fuchsia pink polish 'I've Been Pinkin' nail polish, which looks amazing with the curling top coat over the top. This has been the only colour that I've painted my nails this summer! 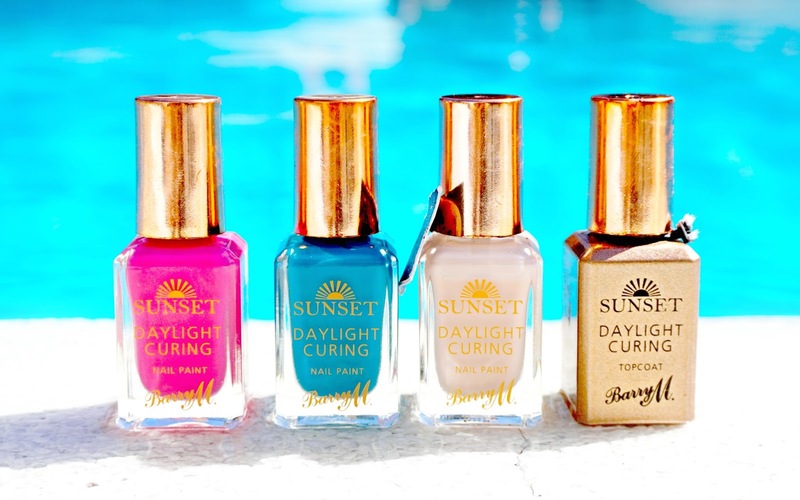 You can purchase the 'Sunset' collection from Superdrug! Wow I love all these colours! I may need to invest in the top coat too. I love Barry M polishes as they always seem to stay on my nail longer than other brands. I need to get my hands on these, they're so pretty! They're so pretty, I need them in my collection! I love that nail polishes! They look so pretty! Love this post! That pink is to die for!